For the last 10 years, the best and most comprehensive option to run Windows® on Mac® has been Parallels Desktop for Mac. Our competitors all have one thing in common: They use cost as a driving reason as to why you should not use Parallels Desktop. However, our competitors often fail to mention the vast differences between Parallels Desktop and their products that make our product worth every penny. Easy to Get Started: Within our product, we offer many free operating systems to help get you started in a virtual machine with one click: Modern.IE, Chromium™ OS, Ubuntu, Fedora, CentOS, Debian GNU, and Android™. Not only do we offer free operating systems but we also allow you to port over your existing Windows operating system from a PC, which can save you tons of money. Additionally, we even allow you to create a VM from your existing Boot Camp® partition OR convert your VMware Fusion VM. None of these options apply to you? Don’t worry—we’ve worked closely with Microsoft® over the years, and now you can buy Microsoft Windows directly through our product. Setting up a VM has never been easier. Seamless Integration: Both Parallels Desktop and VMware Fusion allow for full Microsoft Cortana® integration, which allows you to use both Siri® and Cortana on the Mac. Let’s be honest here—that’s really cool for ALL users out there. However, Parallels also supports iCloud, Dropbox, and Google Drive™, all which save you precious space on your hard drive! Add your favorite programs to your native macOS™ Dock, Launchpad, or even your Internet accounts configured on your Mac. What does that mean? That means regardless of whether your desired file is located on Mac or Windows, you can post to Twitter, Facebook®, iMessage®, or even AirDrop® without rearranging your folders/files/permissions. Performance: Many benchmark tests have deemed Parallels Desktop to be three times faster at suspending the VM and resuming operations. Parallels also wins when it comes to start up time, battery life, and 3D graphics with AutoCAD programs. However, Parallels Desktop also offers real-time virtual disk optimization so it only takes the space you actually need. Need to save extra power for other tasks? Don’t worry, Parallels will pause the VM when no applications are running so you’re not losing resources or performance overall. Ideal for Developers, Testers, and Power Users: VMware Fusion 8.5 and Parallels Desktop both offer support for popular development tools such as Docker, Jenkins, and Chef! VMware Fusion 8.5 does offer Vagrant provider support for an additional fee…but Parallels provides this for free! Not to mention, we also provide the free operating systems mentioned above that allow for quick and easy test environments. Extras: Parallels Desktop also provides other services to enhance your overall experience. Our team has created some amazing tools that lessen your workload and ensure your virtualization needs are met. Parallels Toolbox is a set of one-click utilities enabling you to take a screenshot with a simple click, secure private files with a password, download a favorite video from YouTube™ or Facebook, easily record a screencast, or keep your Mac from sleeping with the push of a button. Parallels Access® is the most reliable remote access to your computer from anywhere. Access all your applications, files, and computers in one place. Not enough? We’ve teamed with Acronis to offer 500 GB of free online storage for one year! 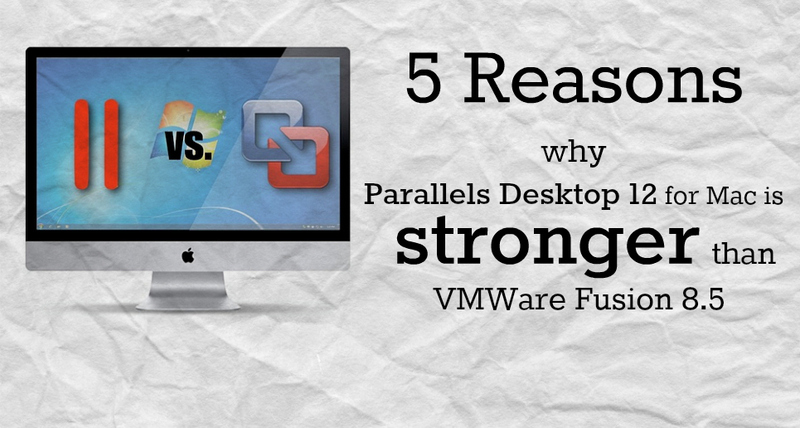 At Parallels, we believe that you shouldn’t have to sacrifice performance for price. Over the last 10 years, we have worked hard to improve our award-winning product, and invite you to experience what sets us apart from our competitors. Try Parallels Desktop 12 for Mac for free now!